This year I am planning on doing a little cleaning up around here. There are some really great recipes lurking way back in my archives that I originally posted in the first few months of this little blogs life. These early recipes are fabulously tasting…not so pretty to look at and a bit confusing to read. I will be re-posting some of these tasty treasures now and then complete with new pictures, improved instructions and the PRINT RECIPE buttons attached. 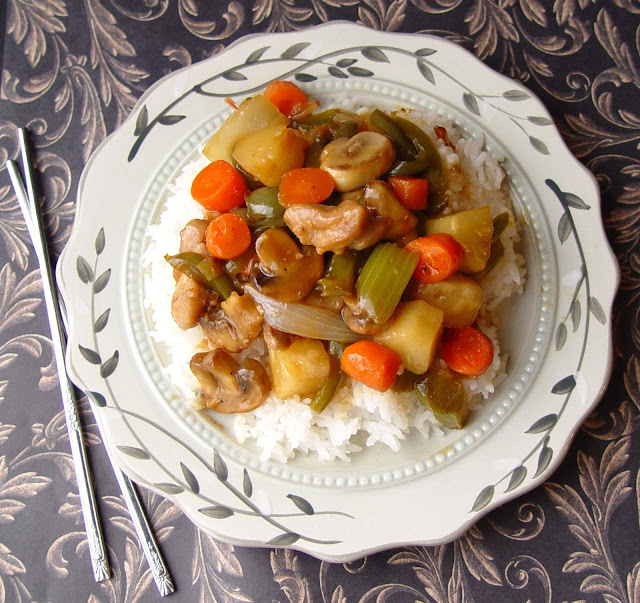 This wonderful Chicken and Vegetable Stir Fry is the first to be re-posted. 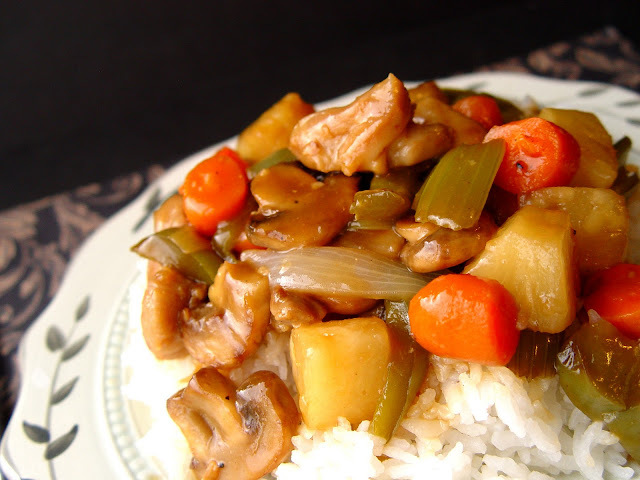 It has a great tangy/sweet flavor, is super healthy and comes together in about 40 minutes. Hope you enjoy it! 1. If your chicken thighs are frozen, toss them in a large bowl and pour hot water over the top. Let them sit in the water until defrosted, should only take about 10 minutes. 2. Heat a large skillet up, over medium high heat. When the pan is hot pour about 2 tablespoons of olive oil into the center of it. Swirl it around so the pan is evenly coated. 3. Use some kitchen scissors to cut up the chicken and place it in the pan. Season it with a bit of freshly cracked salt and pepper. Cook the chicken, stirring occasionally until the outside is golden brown and the inside is no longer pink. Should take about 10 minutes. While it’s cooking get your veggies washed and chopped. 4. Remove the chicken from the pan, put it on a plate and set it aside. Add about 1 tablespoon of oil to your hot pan. Toss in 1 tablespoon of garlic (the kind from the jar works fine) and just a teeny tiny pinch of red pepper flakes. Don’t go crazy here. A little goes a long way. Let the garlic get a bit brown as you stir it around in the pan. 5. Add your chopped vegetables to the pan. Cook them over medium high heat until crisp/tender, stirring occasionally. Should take about 10 minutes. 5 tablespoons of rice vinegar, 1/2 cup sugar, 4 tablespoons soy sauce, 1/4 teaspoon ginger, 2 tablespoons corn starch and a pinch of red pepper flakes. Stir it well with a whisk. You want to be sure that the corn starch is fully dissolved. along with the pineapple chunks. 8. Pour the sauce to the pan as well. Stir it around so that all the veggies are covered in sauce. Allow the mixture to come to a boil, while you stir it with a spatula. Once the sauce has thickened you are ready to eat. Serve with white or brown rice. Stopped by from SITS to share the comment love. My hubby served in Japan….lucky us! This looks easy to make…thanks! I just discovered this recipe on your website and it sounds like something I have been craving. I have a question though. When your recipes call for ginger do you use powdered ginger or do you use fresh ginger root? If fresh, how do you prepare it? I have no experience with fresh ginger and wouldn't know where to begin. You can email me back at jamienewman79 at gmail dot com if you would like. Thanks for all your helping answering my amateur questions…one day I will be a good cook! Thanks again! I just use the powdered ginger. Thanks for the question! I hope you love the stir fry! Just discovered your site to day, I love love love it. Do you have to to use “rice vinegar” do you think? Or would an apple cider vinegar or something work just as well? The anonymous commenter is correct. Apple cider vinegar won't do the trick. I've tried before and my husband who lived in Korea for two years was not impressed. It does make quite a big difference. Good luck! Hope you end up trying it! Smdaa-ckb what I was looking for-ty! I found this recipe on Pinterest today and I'm so excited. I wanted to do something to celebrate the Chinese New Year today with my kiddos and this is the perfect recipe. Thanks so much! Jamie – I love your photography. This stir fry had my mouth watering. I hope when I make it it`ll look as good! Thanks for honestly relating your experiences and opinions and good luck to you. Do you think this would freeze well? I do a lot of freezer cooking to accommodate our family’s busy schedule. Unfortunately, Asian recipes don’t often freeze well. The veggies will get super soggy on you. Best of luck to you!